For every aspect of your process, we have a service to meet your needs. At Tech4, we handle the brains and muscles sides of machinery. From CAD services to commissioning, Tech4’s engineers are experts at utilizing existing technology to create the best solutions to maximize clients’ capabilities. In every aspect of the process, we work hard to breathe life into whatever we’re working on. We don’t have an hourly wage mentality. The project is our only focus, and we work better and faster than anyone to ensure that everything goes smoothly. We’re dedicated to being as flexible as our clients need so we can quickly and effectively modify a process and tackle issues without the project losing momentum. Control every aspect of your process, cut out time-wasting steps, maximize efficiency, and improve your bottom line. Tech4’s custom control systems help make the most of your existing equipment to achieve better results. We’re committed to providing our clients with solutions that work best with their process. To determine what control system is best for your process, we will visit your facility, review the process, note what’s being made, how you’re doing it, why you want to change it, and analyze ways to improve the process. Our engineers then work with your plant engineers to draft a custom automation solution, working with everyone through each step to ensure that everyone’s kept current with the project. Fast, precise, and logical, Tech4 provides drafting and documentation that are technically correct and clearly convey the documents’ intent. Technical drawings need to be clear and concise. One look should be enough to see everything an operator needs to know. We draw all our schematics for easy reference and often show diagrams of the control systems for clear reference points. When Tech4 is used to modernize the control aspects of pre-existing equipment, we also update the existing drawings to reflect our new updates. We continually update our hardware, software, and knowledge to ensure that our clients receive only the most advanced service. In systems that employ computer-based HMI, all documentation can be published online in HTML format allowing immediate access to system drawings or manuals via a web browser. Drawings can also be emailed, faxed, or mailed. If complete sets of project drawings are needed, prints and markups can be sent FEDEX or UPS overnight. Tech4 offers custom programming of new or existing control systems for any automation need. Make use of our deep knowledge in PLC platforms, motion control, tension control, and drive systems. Our extensive experience with many different automation platforms and applications provides us the experience and knowledge to accurately and efficiently develop your control and HMI programs. We only recommend control platforms and HMI/SCADA applicantions we thoroughly know and have successfully implemented. 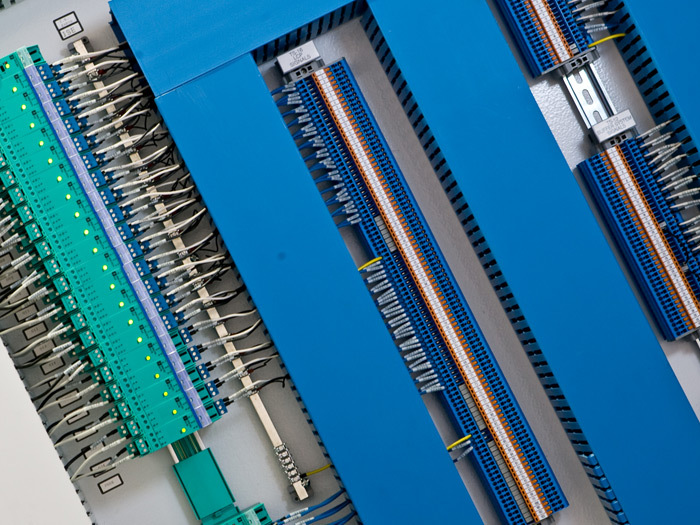 To streamline the installation of a new process, we recommend using our electricians to pull and land the wires to ensure that everything is properly connected. Tech4 takes great pride in doing some of the best wiring work in the industry, and our electricians’ skills can turn a jungle of cables into a clean and intricate installation that’s easier to access and maintain. Using our electricians saves time by removing the lengthy wire-check and troubleshooting of someone else’s work. If you have the electricians already on the project, we can supervise the installation of the machine wiring to ensure that it’s done to specifications. Efficiency is key during the commissioning phase. Everything needs to be done right the first time to avoid delays. Tech4’s design engineers personally oversee each commissioning. Our specialized knowledge of how and why a process works helps us shorten the time from initiating the process to starting the machinery. Knowing the theory and instrumentation behind the process greatly increases how quickly it can turn around, saving time and money. To ensure that each step is properly carried out, we prioritize the tasks, and personally manage the process so every step is properly completed in the correct order and on time. We use only design engineers for field service because they understand the machinery from a design perspective. More effective than a general technician, they have deeply worked with a wide range of industries from conversion to material handling, and they have the experience to quickly troubleshoot on the job. We understand both the theoretical and practical perspectives of what needs to be done, why and how it was designed, and what solution is best, right there on the spot. If you need immediate assistance, we will troubleshoot the problem over the phone. After the control system is in place, we offer training so our clients know how to operate and maintain the system. Sometimes the technology is quite advanced from the clients’ previous applications, and we take the time to familiarize the operator(s) on the new processes, how it’s all put together, why it works, and how to monitor the specific applications. We go through each routine, carefully explaining what processes are in the code, where to find them, how to discern types of activity in all sections, and how the various controls and hardware are interrelated.